The medieval city was seen as a crowded, bustling place, with people, horses, carts and wagons all moving around. Just as in our modern city, this would all lead to inevitable traffic problems. In his book Street Life in Medieval England, G.T. Salusbury devotes an entire chapter to medieval traffic problems. Ranging from obstructions on the roads to carts getting in accidents, they reveal that city authorities were often kept busy dealing with relieving congestion in their streets. Perhaps the most common problem was the seemingly never-ending fight city authorities had with making sure that its residents were not blocking the roads. These issues could be small – like someone leaving building materials in the street, or having a merchant decide to spread his goods on the roadway, but mayors of medieval towns were often adding new laws to deal with these situations. If you sold old clothes in Bristol, they had to remain in your arms, and if you were a hay merchant in Northampton, you could only carry it on your head until you sold it. Meanwhile, the city authorities of Leicester issued a new law in 1467 stating that building materials like stone, timber and clay could only be kept outside of houses for a maximum of three days. Urban officials also had to watch out for property owners who wanted to expand their buildings, often by taking away bits of the street. Noting that the narrow streets would be impeded, mayors and aldermen would order building owners not to proceed with their expansion plans, and in some cases, even had parts of buildings torn down. The efforts to stop these building extensions even meant having to say no the king at times – during the year 1312 King Edward II wrote to the city of London that he wished to make an addition to one of the houses he owned. Another problem for city authorities was the habit of residents to keep animals, and then letting them out onto streets. The most troublesome of these were pigs – people would let them out, knowing that these animals would forage through the trash for food, but this could also lead to them creating more mess in the streets, and even knocking down people. Officials throughout England were trying to find ways to stop this practice, with London and other cities issuing orders that if a pig was found wandering the streets, it could be killed automatically – and if the owner wanted to have the carcass afterwards, they would need to pay four pence for it. Other towns also had laws to keep dogs on chains or leashes. Carts and wagons could be another big traffic problem in the Middle Ages, starting with the fact that many had wheels shod with iron, which would rip up the pavement of the streets. These were often banned. On occasion, one would also see limits placed on how many carts could be in a certain area or go through city gates, as people complained there were too many of them. that no carter within the liberties shall drive his cart more quickly when it is unloaded, than when it is loaded; for the avoiding of divers perils and grievances, under pain of paying forty pence unto the Chamber, and of having his body committed to prison at the will of the Mayor. While we rarely find mention of bad driving from the Middle Ages, there are some cases reported in the Coroners’ Rolls where people were killed in accidents. 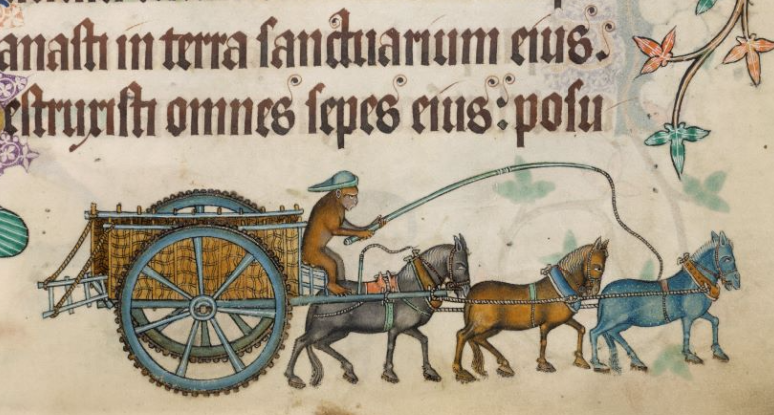 In one case from London in 1336, “two carters taking two empty carts out of the City were urging their horses apace, when the wheels of one of the carts collapsed.” The cart fell over and landed on Agnes de Cicestre, killing her. In another case, also from London, Ralph de Mymmes, a 12 year old boy, was driving a water-cart with a cask full of water down, being drawn by two horses, when a wheel of the cart crushed a seven-year old boy named John Stolere, who was sitting in the street relieving himself. John was immediately killed, while Ralph fled, leaving his horses and cart behind. A survey of medieval street regulations may conjure up a picture in the mind of much bustle and confusion, of noise and dirt and constricted movement, which all the well-meant efforts of borough officials could never make much more orderly and clean and free moving, but that picture is remarkably rural in tone, and there is something about the very perils of traffic which makes it more human and likeable than any vision of a busy thoroughfare of today, where in spite of tarmac, signals, codes, and decorum, the nerves are always tense, and death strikes like some metallic thug.